Smucker’s Uncrustable peanut butter and jelly sandwiches, served to millions of students through the National School Lunch Program, are being recalled for possible Salmonella contamination, Food Poisoning Bulletin has learned. Certain varieties of the crustless, individually wrapped sandwiches sold in bulk boxes to school districts nationwide contain peanut butter made by Sunland Inc., a Portales, NM peanut butter maker whose recall, issued in late September, has grown to include more than 240 products. The U.S. Department of Agriculture (USDA), which operates the National School Lunch Program, issued a “food safety hold” on the sandwiches last week after the J.M. Smucker Co. initiated a voluntary recall of the sandwiches. 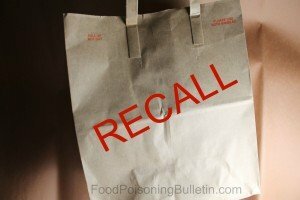 The recall has yet to be posted on the company’s website or on the websites of the USDA, the National School Lunch Program or the U.S. Food and Drug Administration (FDA) which has posted dozens of derivative Sunland recalls. The Sunland recall includes peanut and other nut butters, whole raw peanuts and whole roasted peanut which are included as ingredients in products sold by dozens of other companies. Sunland also makes peanut butter for a variety of retailers including Trader Joe’s, whose Valencia Creamy Salted Peanut Butter made with Sea Salt has been linked to a 19-state Salmonella outbreak that has sickened 35 people, most of whom are children under 10. Sunland recently halted production and distribution of all products. The Smucker’s product under recall are “specific lots of institutional 72-count bulk packs of Uncrustables Sandwiches produced for, and distributed exclusively through, foodservice sales channels,” according to a memo obtained by Food Poisoning Bulletin. The recalled sandwiches were produced both commercially and throigh the USDA Foods Program. The following product codes are included: 5150006611, 5150006612, 5150006620, 5150006621, 5150006650, 5150006651, 5150006655, 5150006656, 5150006659, and 5150006660. The “best if used by” dates are from April 1, 2012 to November 14, 2012. My school pulled the uncrustables from the lunch line last week! No products made by The J. M. Smucker Company are included in the Food and Drug Administration recall of foodservice peanut butter and peanut butter products. Our peanut butter products and brands are safe for consumption, including Smucker’s®, Jif®, Smucker’s Uncrustables®, Adams®, Laura Scudder’s®, Eagle Brand® and Pillsbury® brands. The J. M. Smucker Company does not purchase peanuts or any ingredients from Peanut Corporation of America. We are confident that our comprehensive product safety and quality assurance policies and procedures, which include testing for the presence of Salmonella, ensure the safety of all our products, including our peanut butter and our products containing peanut butter. Consumers may contact 1-800-283-8915 with any questions regarding this issue. That information from Smuckers is about the Peanut Corporation of America outbreak and recall from 2009. It is not about the current recall and outbreak linked to Sunland Inc. products. We have the documentation to back up our claims; we never write anything without proof. Oh my! We will look into it further here in Missouri schools… Thanks! It appears that the affected products are only those manufacturered with USDA commodity peanut butter from Sunland. Commodities come from different manufacturers across the nation, so it will vary state to state and region to region. Schools/states can elect to have commodity PB converted to Uncrustables or other PB products. Smuckers did not manufacture this peanut butter, so all smuckers uncrustables are not impacted even if they have the same Best if Used By dates and Products codes as those recalled.